This morning I wrote about NetBase Solutions’ healthBase, a semantic search engine that aggregates medical content from millions of authoritative health sites including WebMD, Wikipedia, and PubMed. But is it a semantic engine or an anti-semitic search engine? Several of our readers tested out the site and found that healthBase’s semantic search engine has some major glitches (see the comments). One of the most unfortunate examples is when you type in a search for “AIDS,” one of the listed causes of the disease is “Jew.” Really. The ridiculousness continues. 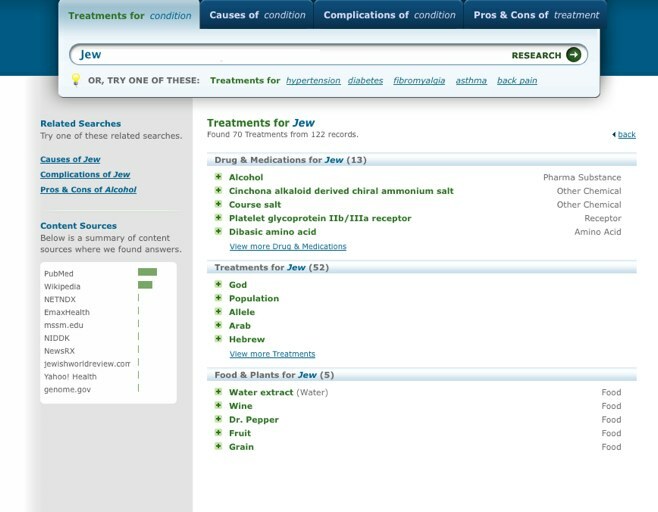 When you click on Jew, you can see proper “Treatments” for Jews, “Drugs And Medications” for Jews and “Complications” for Jews. Apparently, “alcohol” and “coarse salt” are treatments to get rid of Jews, as is Dr. Pepper! Who knew? I’ve included the screenshots of the results below if you don’t believe me. Now, I don’t think that healthBase is being intentionally anti-semitic, but for a technology which is supposed to understand the nuances of human language, this is about a big a fail as you can get. It is plainly obvious that its technology needs to be fixed before it is parsed out to other companies and media corporations. This is an unfortunate example of homonymy, i.e. words that have different meanings. The showcase was not configured to distinguish between the disease “AIDS” and the verb “aids” (as in aiding someone). If you click on the result “Jew” you see a sentence from a Wikipedia page about 7th Century history: “Hispano-Visigothic king Egica accuses the Jews of aiding the Muslims, and sentences all Jews to slavery. ” Although Wikipedia contains a lot of great health information it also contains non-health related information (like this one) that is hard to filter out. Personally, I think such basic distinctions should have been ironed out before launching the site. This is just the most flagrant example of site giving non-health answers to health-related questions. If you look at the pros of AIDS (yes, it thinks here are pros to having AIDS), it comically lists the “Spanish Civil War.” One of the causes of hemorrhoids is “Bronco” (I don’t even want to know). HealthBase is touted to be a showcase for NetBase’s semantic technology, which can supposedly understand language. Clearly, it doesn’t understand language well enough. And if the technology is going to be peddled to other companies to be used to power additional search engines, it needs to be improved immediately. ready-for-primetime consumer search engine it is not. healthBase yesterday surfaced a few embarrassing and offensive bugs. more determined than ever to showcase the power of this new technology. please keep telling us what you think.